Welcome to Week 3 of Photo of the Week! This week, I have for you what I consider to be *my* first kitchen. Sure, I lived (and cooked) in a handful of places before this kitchen, but this was *my* first kitchen. *This* kitchen was the kitchen in my itty-bitty, <300 square-foot studio apartment that I lived in junior year of college, solo, just a couple blocks from University of Michigan campus, and right across the street from Raja Rani. Note the Hello Faz and Burrito Joint menus affixed to the fridge, and the blender stored on the floor. So practical. Also note the oven mitt stored on the back of the range – so safe. Prior to junior year, I lived in a dorm (without a kitchen) as a freshman (though I worked in the dining hall! 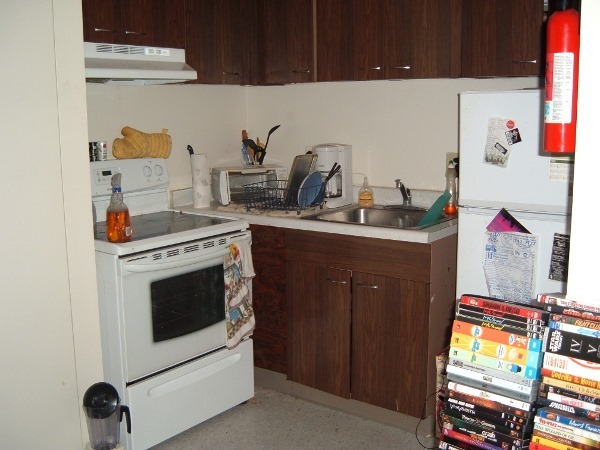 ), and then lived in a 10-bedroom house with TWO kitchens as a sophomore, but this was *my* first kitchen. And there was clearly not much to it. I totally dug my brand-new glass-top range, even though Hamburger Helper was probably the fanciest thing ever cooked upon it! There was absolutely zero counter space to speak of so much of my “prep work” (aka… ripping open Hamburger Helper cheese powder packets, or dumping rum and fruit into my blender to make daiquiris?!) occurred on top of that very glass-top range. And this was the year that I learned, the hard way, that one should NOT dump a bowl of white rice down a garbage disposal and expect it to disappear. Nope.